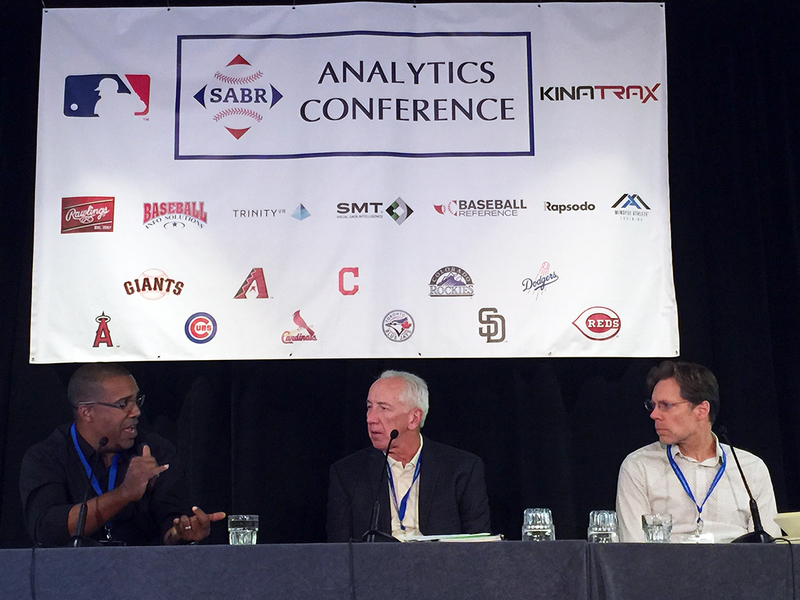 The eighth annual SABR Analytics Conference kicked off on Friday, March 8, 2019, in Phoenix, Arizona with exciting panels and research presentations that set the tone for what is always an incredible conference. The panels and presentations flowed perfectly into the Diamond Dollars Case Competition, in which teams of graduate and undergraduate students make presentations on a real-life baseball operations decision in front of MLB front office executives. Friday’s opening panel focused on The State Of Analytics, featuring Baseball Info Solutions owner John Dewan, ESPN analyst and former MLB player Eduardo Perez, and award-winning author and SABRcast host Rob Neyer. It was moderated by SABR President Vince Gennaro. Dewan reflected on how the analytics movement has progressed since the inaugural SABR Analytics Conference in 2012, specifically in regard to defensive shifts. He said the Tampa Bay Rays were the only team to experiment with the shift at the time, and their 90-win season that year began opening some eyes around the league to the appeal of shifting as a method to prevent hitters from reaching base. Neyer added that the way teams approach analytics has changed drastically as well, saying that a team being “behind” in the analytics movement means something very different now from what it meant six years ago. “Now, 'behind' means that you only have five or six guys in your analytics department instead of 15 or 20,” Neyer said. Perez furthered this idea, saying that the way teams see analytics is apparent not only in how they hire people in their analytics departments, but also in how they hire coaches and managers. He also thinks there is still much more room for baseball to grow in the coming years: “I don’t think we even know how far technology can still take us,” he said. 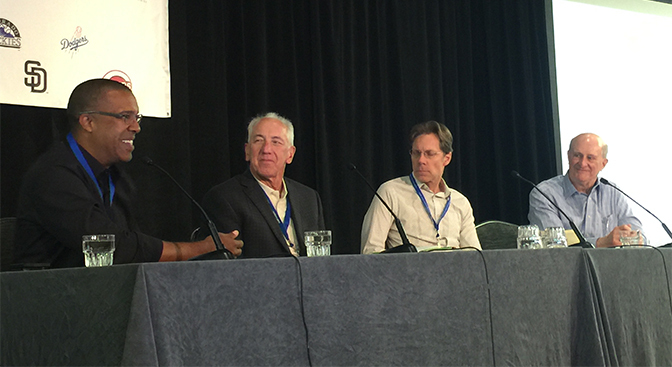 The panelists addressed the question of how analytics have changed the way baseball is played. Neyer felt that analytics have “absolutely hijacked” the game, changing the ways teams evaluate players. MLB has more hard-throwing pitchers than ever before, which has led to an increase in MLB’s ”three true outcomes” (strikeouts, walks, and home runs. The panelists also discussed how analytics can affect the product MLB puts out on the field, given how other professional sports leagues have been able to use new technological and statistical advancements to attract more fans. Neyer said MLB needs to use analytics to its advantage, and they should be deployed not just to improve players but to make the game altogether more entertaining and appealing to a younger audience. Perez added that pitch clocks and other rule changes would not drive baseball fans away from their beloved game. As someone who has worked for a number of MLB teams in coaching capacities, he said that “communication is key” to getting players to embrace analytics. Players have become more accepting of analytics over the years, he said, and coaches have played a major role in communicating changes to these players in a way that can help them improve their on-field performance. The State of Analytics panel at the 2019 SABR Analytics Conference provided an overview of just how much the analytics movement has progressed over the last few years and how teams, players, and fans have begun to accept analytics as not just numbers, but as a way to evaluate player talent. This page was last updated March 9, 2019 at 12:53 am MST.